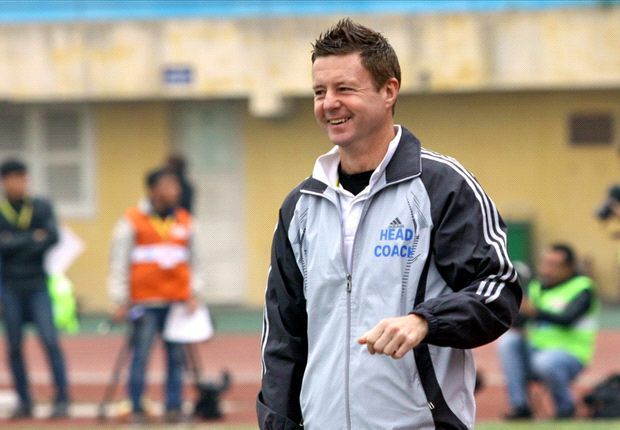 Gor Mahia have officially announced Briton Dylan Kerr as their new coach. Kerr becomes the fourth British coach in the history of the club after Len Julians, Bobby Williamson and Frank Nuttall. “Gor Mahia FC is pleased to announce that Dylan Kerr will join the club as Head Coach with the tactician expected to link up with the team on Saturday, 8th July 2017 ahead of the team’s departure for Tanzania. The decision to appoint Kerr comes after an executive committee meeting held on Tuesday evening,” read a statement from the club. Currently attached with English fourth tier side Chesterfield as their under-18 manager, Kerr said he has “always dreamt of handling a top club” in East Africa. “I have always been interested in the top team from East Africa but as you know, there’s always others that are in the position. On this one though, I am optimistic,” said Kerr. “I know Gor Mahia, I love their fans. They are the soul of the club. It will be an amazing job for me,” the former Simba SC tactician told Nation Sport from his base in England. Club chairman Ambrose Rachier said the new man will be assisted by club legend Zedekiah “Zico” Otieno who has been in charge since the resignation of Brazilian Jose Marcelo Ferreira four weeks ago. “Kerr has worked in South Africa with Mpumalanga Black Aces. He has been in Tanzania with Simba thus has an experience of coaching in Africa. We had 21 applicants but whittled down the list to two and settled on Kerr,” he said. The former Sheffield Wednesday and Leeds United left back has also worked in Vietnam and Scotland. His immediate task will be to lead K’Ogalo in a friendly match against English side Everton FC on Thursday next week at the Benjamin Mkapa National Stadium, Dar es Salaam. Hehehe…You wanted a white skin….ndio hiyo ! In as much as I have 100% complete belief in almighty AR , I think this will be the shortest serving coach in kogallo’s history. Watch this space my brothers, just watch and learn ! White skin, brown skin, yellow yellow, red skin, even green skin like our club colours. Jodala or non Jodala, Prime Ministers, Senators, Aspiring Women Reps, politicians, guests of the state, K.Street workers/patrons, priests and pastors, criminals, your best friend or your worst enemy etc etc all may be die hard loyal supporters of GMFC. LIVE AND LET LIVE.GMFC DOES NOT CHOOSE ITS SUPPORTERS (OR HATERS). Once hired (until termination) one becomes a good coach and/or player or an under performer but is A JAGOR. Zico was an exceptional player but even his second bite as head coach of GMFC has run in headwinds (or are just Mugabe’s machinations) P.S Of course you’ve very right to express your views. What’s wrong with the likes of Jakoyo?? ?give us a coach of your choice then! Prophet of doom! Yawa from 4th division Chesterfield under 18 coach to Head Coach of 1987 CAF Winners “Mandela” Africa Continental Champions. Bloated EC choice based on WHAT? Trial & error! Does this continual avoidance of proven regional coaches with knowledge of talented players in the region in preferance of “foreigners from far” have anything to do with EC’s tight grip on player signings e.g kes 4M problems. That said KARIBU “KER” Dylan but take keen note of our position in the league. A chance to build your CV BUT WHATEVER HAPPENS JUST LEAVE US WHERE’VE FOUND US TOPPING THE LEAGUE! Jakoyo be optimistic for once. That said and done I am left digesting Ker’s comment that he has always dreamt of coaching a top club in East Africa. Is Simba not a top club? Is TZ not part of East Africa? Hmmm….a white man as an assistant coach in Africa? With all these, I think probably Sam Timbe’s time in Gor Mahia has not reached. Tialala. Even Nutall was only a fitness trainer before joining Gor, came, saw and conquered. All Ker needs to know that that soul he talks about will love or hate him based on what he does on the pitch!!! Well said. In Gor the last single match decides whether you are a good or bad coach. FN was a good coach but having lost the derbies some had reservations, Ze Maria won all his derbies but lost to bottom teams. Zico won us a tri to play Chelsea but now is a bad coach having lost to Sofa and couldn’t beat Ulinzi. Nutall has a UEFA Pro license, was a FIFA instructor i.e had the papers. Huyu “Ker” naye has what? Please tell us, Jasego my friend. Mugabe shenanigans are designed to keep Gor Mahia as mediocre club. If this guy turns out to be a good coach is more out of luck than by design. A 50 year old divison 4 youth coach? Jasego again shed some light on qualifications! Zico should resign in protest. Even EC IS A BIG JOKE to rubber stamp such mediocrity. 10 years of essentially structureless, confused leadership we are surely paying a heavy price. @Oduor12, we are tired with your continued criticisms without giving the way forward. I think you need to grow up and learn to appreciate the little. Why can’t you apply for the role of Gor Mahia FC coach? I had my preference which I didn’t get , I support what we have been given bcoz I have no reason or basis to doubt him , I belong in the category who wish him well bcoz if he succeeds its us who benefit , on the flipside I castigate and condemn those who are already wishing him failure so as to have their I told u so moment and u can notice by how childish it becomes when an overgrown child attributes what we wish for our club to a white skin , they wanted to carry on in this site like trusted moles only for their realization that they r mere disposable pawns when their benefactor didn’t even have the courtesy to inform them that the rein of Zico , another pawn was coming to an end. @Oduor 12 has clearly put it; ‘A 50 yr old under 18 coach of a 4th division team!’ what a tongue twister,yet we leave a coach who coached a Seria B side now in Seria A;Sampdoria. @Moses, Why can’t you also apply for the coaching role? Age of the coach does not matter but his performance in winning games. This guy has barely set foot on kenyan soil and people have already started condemning him.What happened to giving people a chance to prove themselves? Nuttal come with an unproven track record and made it…Nkata was branded a failure but won a double with Tusker.Not everyone without a poor track record is doomed to fail…and not everyone with a splendid track record succeeds..!! !let this guy be judged with time!! @Jamigori, Why didn’t you apply for the coaching job as and when you were wailing “ZICO MUST GO!”. This coach is a gamble more than all our previous foreign coaches. Why did EC lower the bar so much, financial constraints or what? Is it just any foreign coach will do? Age does matter by 50 we should have seen some milestones but hopefully let him start with GMFC. With those strong reservations i support for the my love of Mighty Gor Mahia. @Oduor Zico had to be relegated to where he belongs and for your information I am not a coach but you appear to know it all in management, coaching, blogging, lying, sulking, complaining, crying, weeping, leading, commenting, hululating, opposing, policing, witching, etc. You left out chairmaning. Oh I remember you are the international banker who knows what jobs bloggers should be applying for? The EC has done a commendable job of sourcing and hiring this coach within such a short time. He may not be our good, dream coach. Those good coaches with proved truck records are hard to find because they are on high demand and it is the teams within financial muscle that can hire them as they don’t come cheap. One blogger has correctly pointed out that Ker may not be our preferred coach but it is good to give him a chance to prove himself. We don’t need to be anxious since if he does well he shall restore our pride, but if he fails then he will go the way of his predecessors (which in itself will provide an opportunity of getting a “good” coach. Hehehe!) . My only worry is that with the sponsorship collapsed, we definitely will not be able to keep him. Remember that once he does well, he will self-evaluate and surely review his worth upwards. What shall we say then? The he is “making crazy demands” or that “he is taking us to hell with his demands”. Why didn’t we go for an affordable Ugandan like Sam Timbe? You are on point. Here are my questions. (complaints to some) 1) If Zico is THAT HOPELESS (and the recent results didn’t favour him) that he can’t be given even 2 months as a stand in coach why is he retained as the immediate assistant.If unfortunately “Ker” leaves who steps in.ZICO! 2) Is Jakoyo right? Must GMFC head coach be a certain hue. We know that a Kenyan can’t handle the intrigues of our EC but am waiting to see if a 50 year old 4th division under 18 coach with no notable achievement to date can? Hope he gells by maintaining position 1. The real actor must be laughing their head off “donge negidwaro foreign (read odiero) head coach.” Amiyo gi mana “KER”! Can someone name three 4th division youth coaches in Kenya or even Germany/Spain. P.S Macaabi 3 KF Tirana 0. Total aggregate Macaabi 5 KF Tirana 0. Genius eh? Tiki Taka? Hehehe….I also read that and marvelled at how well Tiki taka is working for Ze Maria. Losing 5-0(Agg) barely weeks into the job wont help his CV either way!! !